LinkedIn advertising is by far the most under-utilised social media platform for B2B advertising. LinkedIn advertising is the most powerful social media tool out there when it comes to reaching other businesses. LinkedIn is a social media platform like any other, and for B2B LinkedIn is the most effective one. Whatever your business is, if your targeted client is corporate we would definitely recommend to concentrate your social media marketing efforts on LinkedIn. as we understand the importance of it. Our LinkedIn marketing expert will be able to design a successful B2B LinkedIn strategy for your business. Would LinkedIn advertising work for your business? Most businesses that appeal to corporate clients should do advertising on LinkedIn. The main reason being the possibility to engage with the decision makers without being pushy. For example if you have a laundry business and would like to get large companies on board such as hotels, spas, gyms etc. by participating in the industry groups in LinkedIn and string relevant content you will be able to see who the decision maker is for each of the companies from their engagement with your content. Once you have their contact details and reminded them of the need to use your services, you can get in touch with them and show them your points of difference with the competition. Our LinkedIn marketing expert will create a suitable LinkedIn strategy for your business to help you build an audience of corporate clients. Our expert will research your field, assess your needs and will come up with the best solution for you. 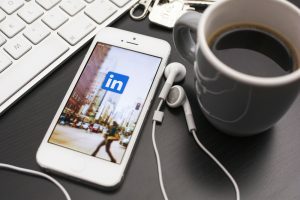 We recommend you use LinkedIn advertising as a supplement to SEO strategy as it is important corporate clients can find your services online if they search for them. We can custom tailor a marketing package for your business. To get started book a free consult with us give us a call at 03 86091078 or fill the enquiry form! © Copyright 2018, 247 Digital.